Within 250 miles of Tempe, AZ. Two-Day Swim Camp – Sign up for one or BOTH days! Create more explosive speed during every start, turn, and stroke at this high performance swim camp! On Saturday (sessions 1 & 2), participants will work on starts, flip turns, and sprint skills for both freestyle and backstroke. Then on Sunday (sessions 3 & 4), participants will work on underwater dolphin kicking, open turns, and sprint skills in butterfly and breaststroke! Your Elite clinician for this camp will be Olympic medalist, former world record holder and NCAA Woman of the Year – Lacey Nymeyer! Lacey is a highly attentive clinician that specializes in speed and power for faster sprinting. Scroll down for more details on the curriculum! Lacey will be in the water leading four sessions, two for each age group, designed for competitive swimmers. This camp is not recommended for swimmers younger than 8 years old. At these sessions, your swimmer will work with Olympian Lacey Nymeyer to improve on the technique necessary to sprint with more explosive and efficient speed in both freestyle and backstroke sprint races. The technique in these events is extremely important with little to no room for error. Participants will work on creating more speed at the start, maintain momentum through the turn, and build more power with each stroke in free and back. STARTS: How you set up on the block including proper hand and foot placement can allow your swimmer to launch themselves forward with a lot of explosive power. Lacey will work with each swimmer to find their best position on the block as well as how to drive forward efficiently into a tight streamline and enter through a small hole. FLIP TURNS: Participants will work to improve the way they carry their momentum through the turn to get in and out of every wall faster. Practice accelerating into the wall with long strokes and then using their core and arms to get through the turn. Lacey will work with the swimmers to find the best position to plant their feet on the wall for a powerful pushoff in the perfect streamline. The drills and exercises that Lacey will do with the swimmers will help participants improve their turns now as well as in the future. SPRINT SKILLS IN FREESTYLE AND BACKSTROKE: Olympic medalist Lacey Nymeyer will reinforce the skills that are required in freestyle and backstroke that will enable a swimmer to swim with maximum length, power, and tempo in their 50s and 100s. Participants will focus on maintaining a straight and solid body line while driving their kick and keeping their strokes long! UNDERWATER DOLPHIN KICKING: The not-so-secret weapon of elite level swimmers is their underwater dolphin kick. Beginning with the solid foundation of a tight streamline, participants will learn to use their core to create a powerful whip through their bodies. Lacey Nymeyer is known as one of the best underwater dolphin kickers in the world and she specializes in teaching swimmers how to unlock their potential in this important skill. 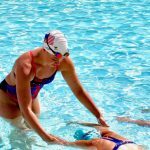 SPRINT SKILLS IN BUTTERFLY AND BREASTSTROKE: As a swimmer increases their tempo in a sprint race, it becomes harder and harder to maintain the timing needed to reduce drag and maintain length in each stroke. Lacey will work with swimmers in this session to find the rhythm that allows for a fast AND efficient butterfly and breaststroke for faster racing. Swimmers and parents are invited to ask Lacey questions during a Q&A session. Gain insight into her training regimen, diet and nutrition, and recovery tactics. Observe Lacey swim at full speed and demonstrate a progression of perfectly executed drills to achieve powerful, efficient and fast swimming. Take a photo while wearing Lacey's medals, get autographs, and a gift from TYR Sport!